Another holiday season is upon us, and trends are pointing to a huge sales opportunity for retailers. According to an article in Bloomberg, retail sales were higher than forecasted in October and marked the largest growth since 2014. The National Retail Federation (NRF) is also forecasting that holiday sales will increase this year. While holiday sales are on the rise, in previous years we’ve seen a lot of this growth coming from online channels. For example, in 2015, more consumers shopped online than in-store on Black Friday. This shift is expected to continue, as Deloitte’s 2016 holiday survey indicates more consumers are planning to shop online rather than at brick-and-mortar stores this holiday season. While online sales will drive the majority of holiday purchases this season, shoppers will continue to blend both online and offline channels during their search for the best gifts. 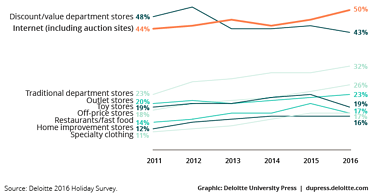 As noted in Deloitte’s survey results, two thirds of respondents will shop online and then purchase in-store (webrooming); half will shop in-store and then buy online (showrooming); and more than 4 in 10 will take advantage of “buy online, pick up in-store” offers. We’ve all experienced crowds and long lines that can turn holiday shopping into an aggravating experience. The last thing retailers want is for customers to abandon their purchase due to long checkout lines or avoid coming into the store because they see big crowds. Retailers can reduce these hassles and keep traffic flowing by simplifying and mobilizing checkouts. Last year we highlighted how ease of checkout was the number one feature holiday shoppers wanted during the season. The data this year showed very similar results. According to PwC’s 2016 holiday report, ease of checkout is the top improvement shoppers are seeking when it comes to a better in-store experience. Putting mobile point of sale (mPOS) solutions in the hands of your staff is the ideal way to achieve this, and it’s the perfect solution for line busting and providing in-aisle customer service. Your staff can serve customers wherever they are in your store and offer fast, seamless checkout. This helps get customers into your store and prevent them from abandoning their purchases while enhancing your brand and their store experience through convenience and innovation. Despite growing use of mobile devices for shopping online and in-store, consumers are still looking to be engaged while they shop. 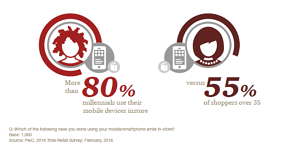 In PwC’s 2016 Total Retail Survey, 70 percent of consumers said they want in-store recommendations from associates equipped with mobile devices. In fact, engaging with sales associates who have deep knowledge of products was second only to ease of checkout as the top way consumers say their in-store experience could be better. 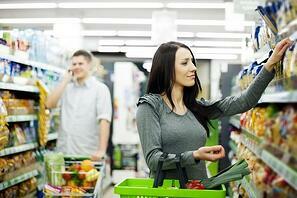 The benefits of one-on-one customer engagement or “clienteling” are enormous for retailers. InMoment’s 2016 retail industry report points out that consumers spend twice as much across all sectors when they’re assisted by a staff member, and average spending increases four times when the consumer is engaged by both staff and a retail brand’s website. 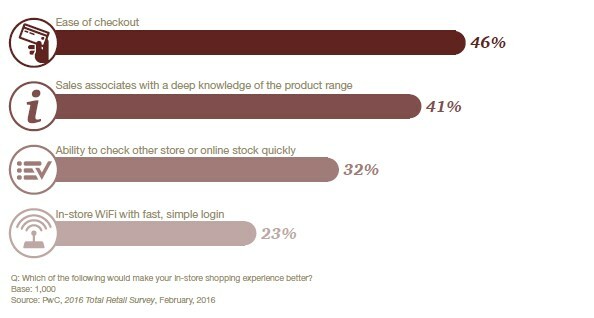 This underscores the importance of combining personal service and engagement with mobile connectivity, so stores should equip their staff with mobile technologies to access product information, inventory, and reviews. This way, sales associates can be as knowledgeable and helpful as possible while using mPOS to provide convenient mobile checkout and personalized service. They can also provide product recommendations, allowing them to upsell or cross-sell additional products and increase revenue. Additionally, this level of customer engagement helps increase brand loyalty by creating a personalized experience that online sellers and eCommerce channels simply can’t duplicate. Another innovation retailers should consider is accepting mobile wallets and NFC/contactless payments. These payment options are known to speed up the checkout process by allowing shoppers to use their smartphones or their NFC-enabled devices, such as an Apple Watch, to pay. Whether it is a retail-branded mobile payment option or services, such as Apple Pay and Android Pay, merchants can provide shoppers with a convenient way to pay for their purchases. Unfortunately, the retail industry has lagged in accepting mobile wallets. For example, according to PwC, fewer than 10 percent of retailers accept Apple Pay. Retailers should take note that 80 percent of millennials and 55 percent of shoppers over 35 use their mobile devices while shopping in-store, and many of them already use Apple Pay and Android Pay to make purchases when possible. According to the Deloitte report, 13 percent of shoppers, who own smart phones, plan to use mobile wallets to pay for their purchases this holiday season. Retailers who accept NFC/contactless payments have a clear advantage in offering an enhanced customer experience and are ideally positioned to build brand loyalty and attract repeat sales, particularly among younger shoppers. According to PwC’s Holiday Survey, 80 percent of millennials use their mobile devices in-store to access digital coupons and research products. Also, in a 2016 holiday insights report from couponing app RetailMeNot, half of the consumers say finding a good deal beforehand will push them to visit stores during the holidays. It’s also important to note that more than half of millennials say they are price-conscious, and 73 percent of shoppers 35 and older say the same according to the PwC report. So, as consumers continue to keep an eye on the best deals and promotions while doing their holiday shopping, retailers should consider adding or expanding mobile couponing capabilities at the point of sale. Retailers need to finally begin fully implementing their omni-channel strategies in order to create consistent and quality experience across all channels, including their website, eCommerce, social media, consumer devices and the in-store environment. Google research has shown that omni-channel shoppers have a 30 percent higher lifetime value than those who use only one channel. Also, according to research by SDL, 90 percent of holiday shoppers expect consistent brand experiences across channels and devices. Implementing an omni-channel strategy that provides consumers with a uniform, frictionless experience can provide huge dividends for retailers. You can start by combining online eCommerce and in-store locations to create new delivery and customer service options. Click-and-collect options for in-store pickups are becoming increasingly popular, allowing customers to shop online and pick up their purchases at their nearest store rather than wait for home delivery. An added benefit is the opportunity to deliver more offers and capture impulse buys by bringing those customers into the store. Major brands such as Best Buy and Target are having huge success with their omni-channel approaches, which incorporate all of these elements. According to PwC’s 2016 Total Retail report, this helped Best Buy increase its online holiday revenue by 13 percent in 2015, while Target saw a 30 percent increase in its digital sales in just one quarter last year. While Black Friday has come and gone, the holiday shopping season is far from over. In fact, weekends in December generally have a better chance at capturing traffic and sales because of last minute shoppers. In 2014, 36% of shoppers saved their purchases until the week before Christmas. But just because shoppers tend to procrastinate doesn’t mean retailers should wait to implement these new in-store strategies. As the retail landscape becomes increasingly competitive and the “Amazon effect” becomes a bigger threat to traditional brick-and-mortar stores, retailers need to continuously enhance their in-store experience – as part of their broader omni-channel strategy – in order to meet consumer expectations and keep customers coming back for more. What sort of innovations are you considering or adopting in your stores? How are they working for your business? Share your comments below. If you are attending Retail’s Big Show in January, visit us at our booth #1742 and talk to us about your payment technology needs.  Visit our NRF landing page and receive a complete guide to omni-channel strategies and solutions that help retailers build brand loyalty and drive more sales.